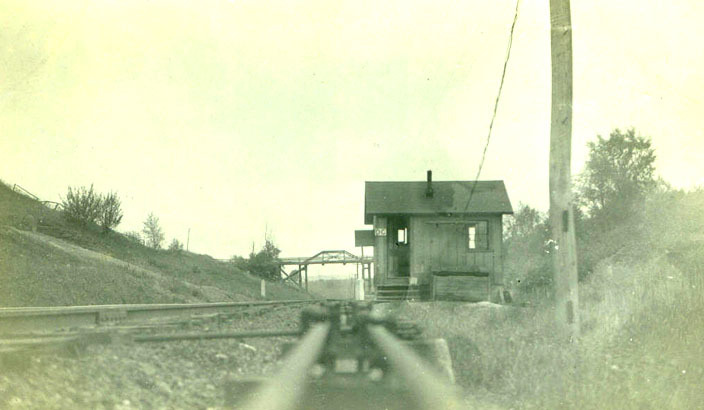 The photograph shows the telegraph building that once stood along the Pennsylvania Railroad tracks in the Deep Cut. The Deep Cut was originally dug for the Genesee Valley Canal, but later was used by the railroad. The bridge in the distance carried Short Tract Road over the cut. The telegraph "shack" was located at Mile Post 53 and was near where William Road crosses the Genesee Valley Greenway today. The remains the of the building were still visible in the 1940s. The Deep Cut is located to the east of the main Park, and runs near route 436. After the railroad closed in the 1960s, the right of way was purchased by the Rochester Gas and Electric Corporation who later transferred it to the State. It is now part of the Greenway trail system. This photograph, and several that appear in a Pieces of the Past page was donated by Jim Gelser. Thanks Jim!